As a supporter of Iowa Gun Owners, I wanted you to be one of the first to know that we recently received a shipment of 100,000 of our window decals! What’s more, we are giving them away to as many Iowans as we can — absolutely free! All you have to do to receive your decal is click on the link below and sign up, and we will mail it to you in the next couple of weeks. These decals look great on your vehicle, garage fridge, or anyplace else you want to display your support for the Second Amendment and Iowa Gun Owners. Following on the heels of a wildly successful 2017 legislative session, we are already making plans to fight for Constitutional Carry next year. As always, it is the grassroots pressure that the members of Iowa Gun Owners provide that makes the difference in Des Moines! So please help us expand the size of our grassroots army by forwarding this email to your pro-gun friends and family — encouraging them to sign up for their free decal, too. We have already given away over 25,000 of these decals, and this is your chance to get one or to replace one that you have had for a long time. To get your decal, sign up here! The fight over Constitutional Carry will be even nastier than the fight over Stand-Your-Ground law — anti-gun legislators and liberal media outlets made that clear all session long. And of course, the weak kneed House leadership team already signaled their willingness to ‘play ball’ with anti-gun legislators earlier this year — by removing Constitutional Carry from this year’s omnibus bill. We will need all hands on deck as we approach the next session. So if you would like to make a donation to Iowa Gun Owners, as we prepare for this fight, feel free to do so. But whatever you do, be sure to help us spread the word about the fight for Constitutional Carry and about our free decal giveaway, by forwarding this message to all of your friends! Iowa Gun Owners has a lot in store over the last couple of months with grassroots activist training, gun giveaways, and more on the horizon. So please keep an eye on your email inbox. Meanwhile, enjoy your free decal! P.S. As Iowa Gun Owners prepares to fight for Constitutional Carry next legislative session, we need all hands on deck! Just like we saw in 2017, it is the grassroots pressure of thousands of gun owners standing together that makes the difference in Des Moines. 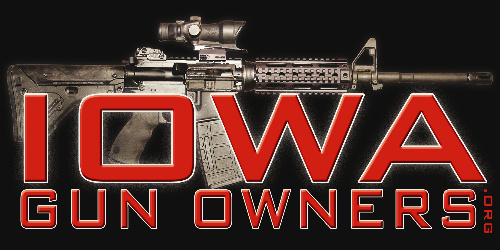 To help grow the size of our grassroots army, Iowa Gun Owners will be giving away up to 100,000 window decals absolutely free! To get your decal, sign up below. When you’re done, be sure to share this message with your friends so they can sign up as well!